One of the first true arcade hits, and rightly so! Defender stretched the boundary of what was technically possible in the early 80s. A game that is still popular today with fans (perhaps still trying to beat its legendary difficulty). Original cabinets are still available, although they are extremely rare - if we do currently have one in stock it will be listed below. Otherwise if you are looking to take on Defender (and win) we would recommend one of our retro multi-game arcade machines. These awesome cabinets will let you play Defender in all its 80s glory but many more games as well. There is one profound truth in gaming. Retro arcade classics were hard! Sans save points and unlimited lives, it was the arcade industry’s prerogative to make these games not only challenging, but damn near impossible. In addition to bringing a monetary benefit to developers in form of more revenue from the constant flow of “just one more” quarters, this vertical learning curve actually developed into a stamp of pride for those who could brave the devious gameplay parameters and achieve greatness. One title that defines the “fun pain” that comes with attempting to complete a highly difficult, yet enjoyable set of actions, is none other than Defender. 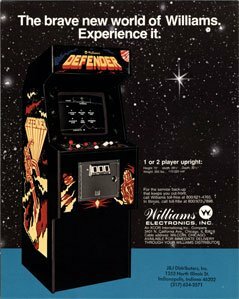 Released in 1980 and inspired by the grandfather of shooters, Space Invaders, Defender expanded on the genre by bringing gamers a technologically impressive title that brought enhanced audio-visual features and evolved gameplay. But this was almost all for naught when the game was deemed a bust at a chicago trade show because of the extreme difficulty. Luckily, these weak-willed humans in business casual attire were not the “Youth of America,” a demographic that seemed to relish the challenge presented in this shooter and singlehandedly made this a classic within the pantheon of gaming. But in all due respect to those at the Chicago show, even the games premise is frightening. In a situation that almost certainly influenced other extraterrestrial titles like Dead Space, you are the lone defender of an unnamed planet in the deep reaches of space, charged with protecting the lives of a colony of humanoids based there. It is your duty to navigate the perilous terrain in an attempt to rid the distant world from countless hordes of alien invaders who are intent on abducting the humanoids that are in your charge. Part of what made this game so notoriously difficult was the fact that abducted humanoids become mutants who will then attempt to attack your ship, creating a vicious loop if you are too slow on the trigger. With only three lives, the player must survive these waves of aliens and mutants in order to restore safety to the planet. Those who cannot stop the invasion will see the planet become overrun with mutants and eventually explode in a grand fireball of lost hopes and murder. While many games had an A + B = C philosophy regarding gameplay, Defender made users think very hard about strategy before making a move. The inclusion of such features as hyperspace opened up many ways to approach the game, while the necessity to kill some astronauts in order preserve the rest of your population introduces difficult choices that border on moral (an unheard of emotion in gaming up to this point.) Even the simple decision to have enemies attack from all directions was a big step in the space. The man we should thank for this practice in masochism is Eugene Jarvis, a pinball programmer turned game designer who wanted to build on the foundation created by titles like Space Invaders and Asteroids. 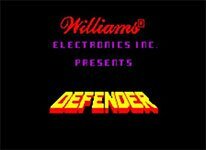 Praised as an innovative title, Defender’s originality was partly the result of management who had no idea about the game development. This may seem like a recipe for disaster, but with the right group of game designers, this could become their greatest asset. For Jarvis and company, the “suits” lack of understanding led to a vast amount of creative freedom that is non-existent in the modern game business. This ability to build their vision from the ground up without interference helped Defender reach its true potential, proving that a great idea, combined with a tech savvy crew willing to use a little elbow grease, could lead to a game that will be remembered forever.